·Designed in USA. Top choice for Pain Relief, Big Toe Protector, and Big Toe Corrector. PODIATRISTS RECOMMENDED. ·PC + Bull leather material. Dual Flexible straps make you feel soft and comfortable. Best for Hallux Valgus Pro and Big Toe Protector. We recommend you massage your Bunion toes and Ball of foot parts after you use this corrector, this can bring a better and quicker effect. ·100% MONEY BACK GUARANTEE. If you need any of our further help, pls don't hesitate to contact us at any time. Scientific 3 in 1 functions design ---- Pain Relief, Toe protector, Toe corrector. Align big toes to correct bunion problems, Protect big toes and fore foot part of your feet. PODIATRISTS RECOMMENDED. Stop bunion pain with flexible bunion splint. Top choice to prevent bunion progression, overlapping toes, hammertoes and to avoid surgery. Blue+White color. Unisex, Used in Night. One size. Dual straps make the corrector fit feet well. 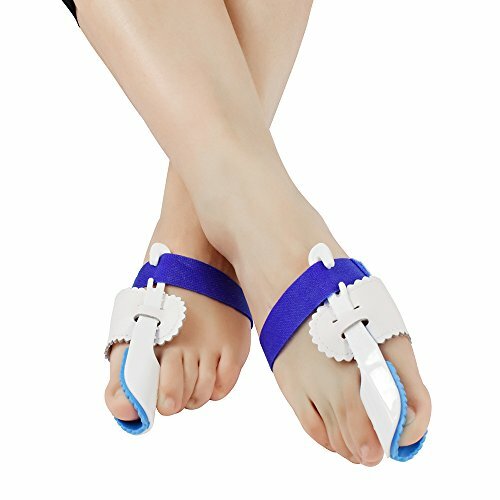 The hinged Bunion Foot Aid splint enables your toes and feet to move naturally while keeping the alignment. PC + Bull leather material. Soft and comfortable, Easy to wear and easy to take off . Espcheap recommends you to wash and dry the straps at least per 2 weeks. Just wear it during your sleeping, watching TV, reading or doing any other relax activities. 100% MONEY BACK GUARANTEE. If you need any of our further help, pls don't hesitate to contact us at any time. If you have any questions about this product by Espcheap, contact us by completing and submitting the form below. If you are looking for a specif part number, please include it with your message.